I thank you for your support during these hard times. I am slowly getting my life back, it is not quite the same as before, but good enough for now. Things have improved (knock on wood, please) from the worst, but they are not back to the state they were. It has meant me a lot to know that you are all there (here) with me. Thank you. but figuring out the shape of the body would have required hours of quiet time and I did not have that. I was lost there for a bit and would just come to my room and sit at the desk and wonder what I should do. 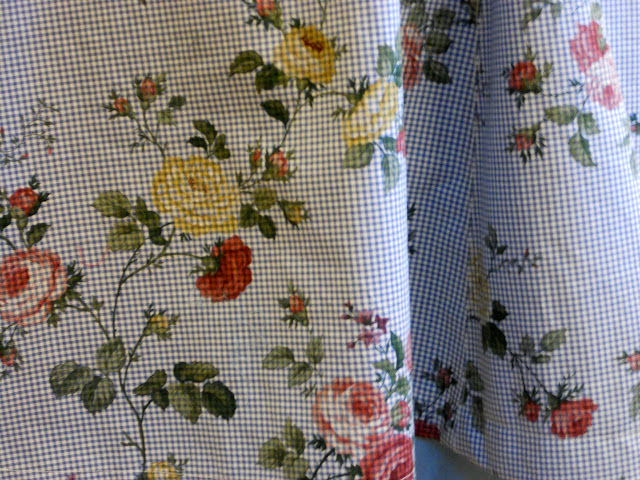 Last summer I bought this sturdy cotton fabric in order to make me a dress from it, something easy to wear in my everyday life. 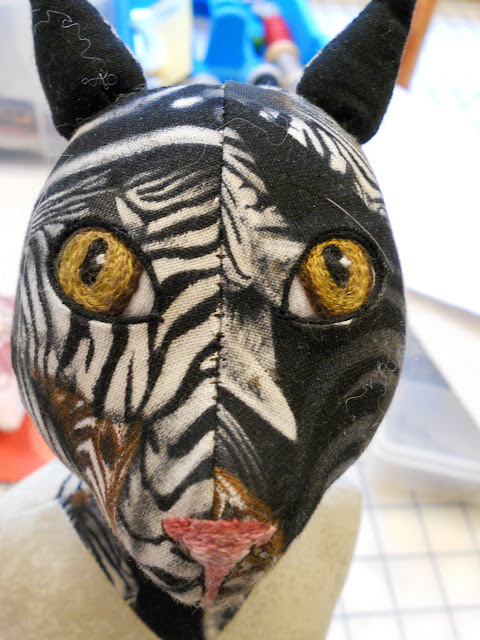 For the whole winter the fabric was hidden away in the fabric closet, but I had put it on my desk before all started going off balance and there it kept staring at me. I decided to make the dress as it was easy to see the process in steps, in short steps, and none of the steps would require too much time and yet I could see the process going forward. My next move was to cut out the dress using my old, good, tested pattern. 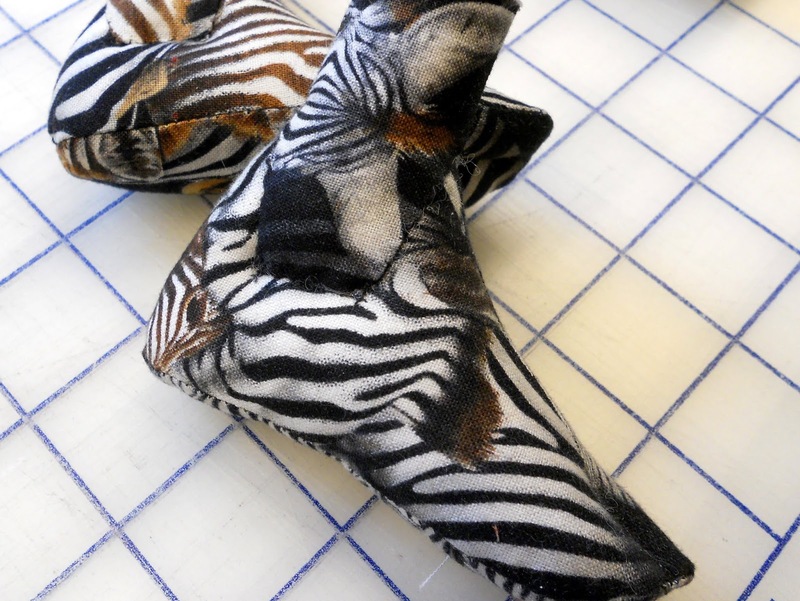 I did not pay any attention to matching the motifs in the fabric pieces, I would not have had enough fabric for that and I did not have enough brain power to do that. 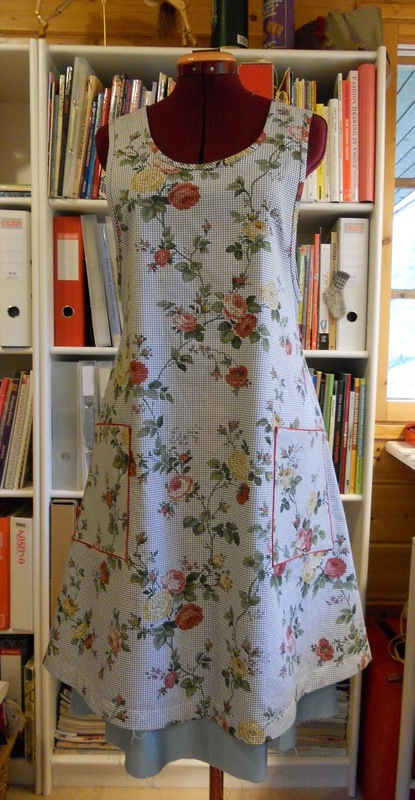 I have modified this pattern from an apron I bought few years ago. I have used the apron a lot and still use sometimes, but it has had its best days. 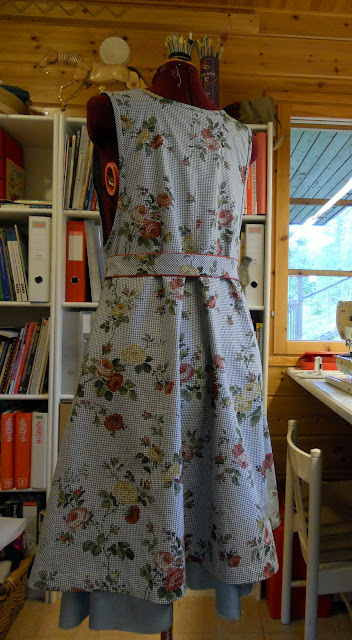 The dress (or is it a dress, I guess it is more like an apron still as I need to wear a top with it) is almost done, the hem of the lining still needs to be trimmed and sewn but otherwise it is done. While making this dress, I have been watching Susan Khalje's online class "The Couture Dress" on Craftsy. And I also updated my profile in Threads magazine so that I am able to watch all the Insider videos and read all the Insider articles on their site. All very valuable and interesting information. I am hoping to make a coat for myself later on and that is why I am taking also "The Starlet Suit Jacket" - class by Gretchen Hirch. This dress, or the fabric of the dress, became my source of inspiration without me noticing it at first. 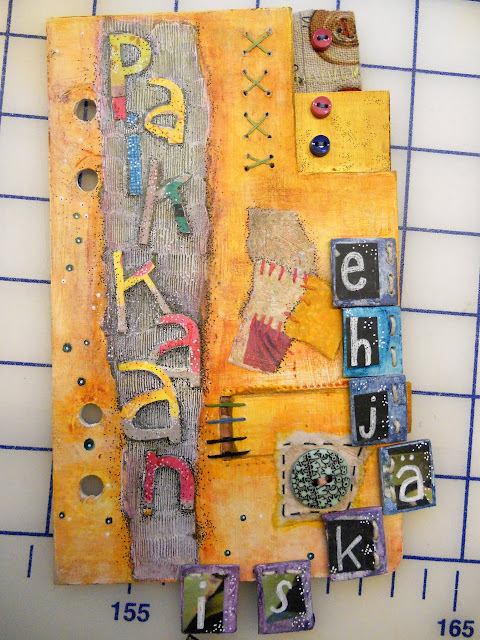 Now that I am well in the process I can see all the different ways it is inspiring me. First of all there is the fabric and the colors in it. There are blue and white checks and there are red and yellow roses. 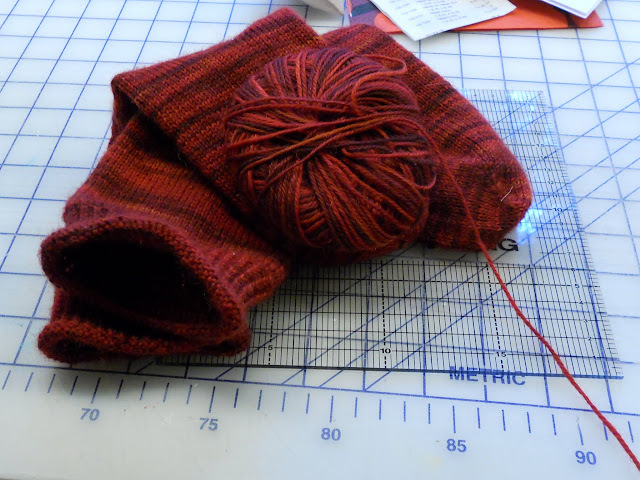 As my first step, intuitively, without giving a lot of thought to the dress nor its inspiration, I did some yarn stash diving and knitted a pair simple socks with my sock recipe with this red yarn. I have lost the band but I believe it is Bearfoot by Mountain Colors, in colorway Ruby River. While knitting the simple, plain vanilla socks I thought about embroidering them. I could not think of a motif and then, only then I really saw the fabric, and realized all the roses and the leaves and wondered if I could mimic the roses on the fabric. And I think it was around this point when I realized that this fabric/dress opened up a whole new world to me. 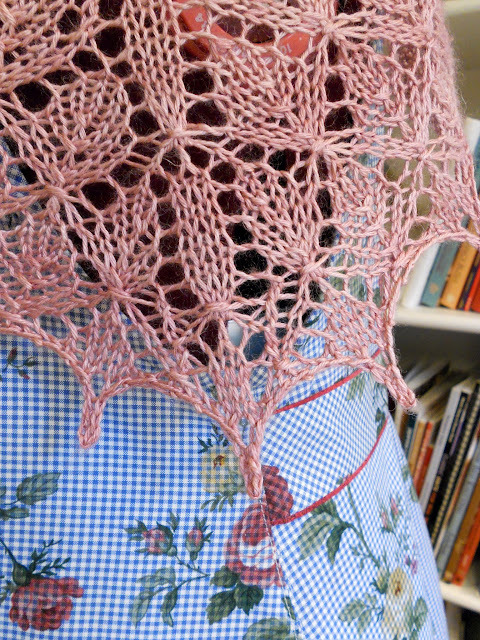 I was still working on the dress when a new shawl pattern by "Designs by Romi" arrived at my mail box. This time I did not have to go through my stash as I had Dazzling yarn sitting on my desk. It has BFL and silk in it and the yardage was 400m, just the right amount for Lyrica Euterpe. While knitting the shawl, I kept thinking how much I love delicate lace and how this shawl really needs to be knitted with lace weight yarn, but kept going on because I really did not need a new ufo at this point. I just had to finish it. I pinned it out on my blocking board and still was not totally happy with the yarn weight. But now that I have unpinned it and have it on the dress, I love the little scarf. It is beautiful and it was a joy to knit, the pattern is easy and it was just the right size for me at this point. From the first stitch I cast on, I could see the last stitch, as there was only this one skein of yarn to knit. I was a bit worried if there would be enough yarn, but with 400 meters and the recommended needle size, this worked out just fine. I had plenty of yarn left. 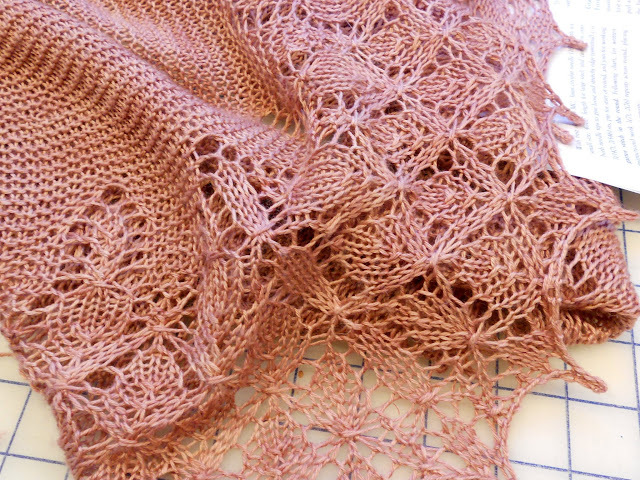 The shawl is this lovely, old rose color, certainly inspired by the dress, but I am not sure if I will keep it for myself or hide it in my treasure chest until someone really needs it. I left out the beads from the shawl as I did not have big enough beads for this yarn, but the beads have been on my mind. So not only the colors crept into my crafting, but the rose motif kept coming back to my mind and so I had to make a rose. I am not sure how much this will resemble a rose when I am done with it, because now I will start adding beads, but really it does not matter, the rose was my starting point. 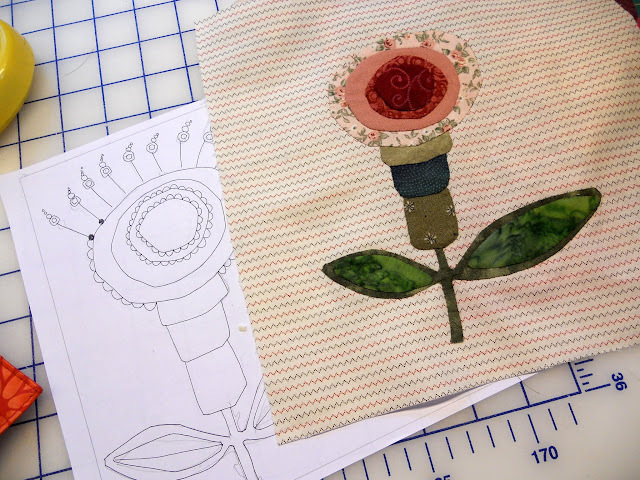 So far the colors in the fabric inspired me to knit red socks and a pink scarf and then the roses made me to applique this flower but there is yet one more path to explore and that is the shape of the dress. A piece of fabric, that I found last summer, and that most likely is made for interior design and not for clothing, has given me a lot more than I ever expected. It was not a mere piece of fabric but a threshold to a whole new world of possibilities. 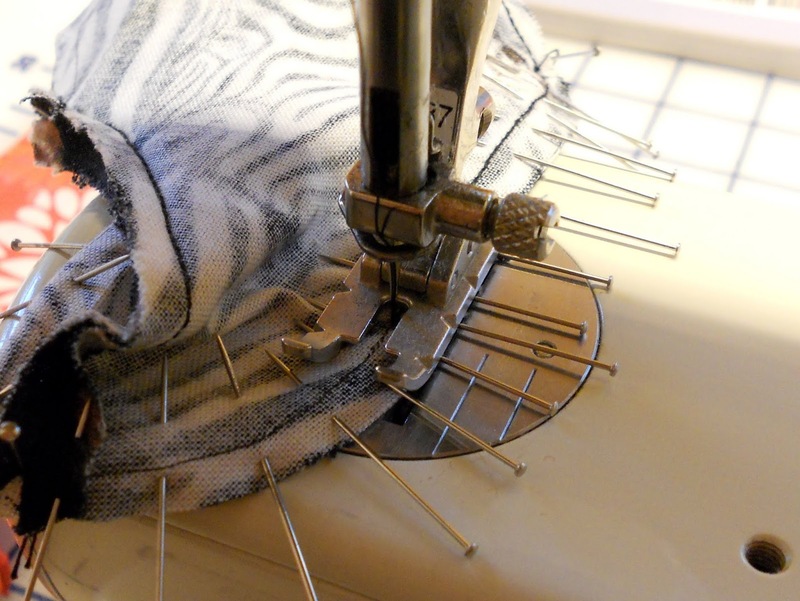 And I am not just yet going to hem the lining, because I am hoping that there will be more. You are so creative--I love everything you show in your blog. Very inspirational for me! So nice for you to have this wonderful outlet for your feelings, and so nice of you to share with us. Thanks! Thank you for the lovely look into your creative process; it was fascinating and beautiful. Were you a test knitter for Romi? I don't know of anyone else who is finished with this new release yet! Your ideas...and your fine sense of aesthetic and colour is overwhelming. I really, really do hope that this wonderful creative process isn't disturbed by future sorrows. This I wish you by heart. Your artistry and boundless creativity never cease to amaze me. I am always struck with wonder and amazement. May the coming days, weeks and months be kind to you and to your loved ones. Actually in my mind I can see a neat little shrug, simply patterned, to go with your beautiful dress. In any of the four colours. Your creative endeavours are very inspiring. I am constantly amazed at the variety of stuff you do keep going girl! Your work is inspiring and your writing is beautiful. The dress looks perfect for midsummer. I hope all is well with you and your family. I too find myself energized by your process. You only need a little time and energy, a little openness to those quiet thoughts. It is a way to keep your own self inside this trouble, and to get through somehow. Creativity does not require an empty schedule. It is what happens in between everything else. Keep putting each foot in front of the other, and enjoy the solstice! So glad it is the solstice today! I enjoy the long days, which are much shorter than your midnight sun. I hope you can have some local berries soon. I love the dress. So clever of you to create it from an apron pattern. Such a beautiful progression, from the dress to the socks and on to the scarf and the rose! And how lovely that these beautiful creations are helping you find your way back to your balance. Lene, you have given me so many ideas for how to handle my own times of stress. Thank you for sharing and for staying with us. What beautiful projects you have created during this hard time. Thank you for sharing. Wishing you and your family hope and joy in the coming months. either way, thank you so much for all the work you put into your blog! i love your animals and cannot wait to see what you come up with next. sooo inspiring again! glad you are feeling better and creative. hugs. What a lovely lot of inspiration from one piece of fabric. Mind you, it is a particularly good piece of fabric. 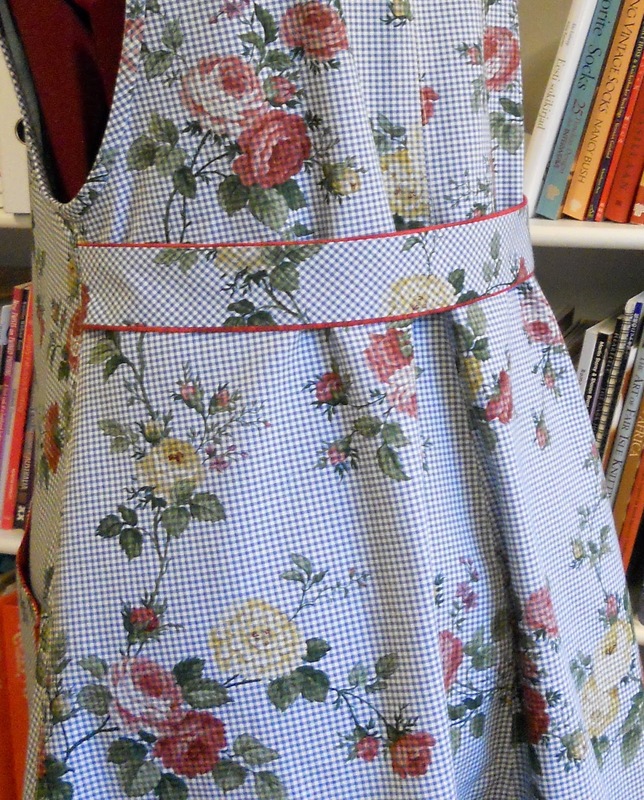 And of course the dress is a "dress" - it is a pinafore dress, and pinafore is a good old English word for apron, so that just proves you right. Have been checking the blog regularly and rejoice that, while things are still difficult, they are not as dark as they were. Prayers continue. So glad that you have been able to *create* -- a dress, a shawl, socks, a (zebra??). All signs of health and moving forward. All good thoughts to you and your family. I am catching up on blogs and ravelry today, and am sorry to hear you've been faced with such difficult times recently. SO very glad to hear that you are moving through and feeling joy in at least on area of your life..hopefully more than one area, and hopefully more joy to come. All good thoughts being sent your way! Why hello, Lene. I've been checking here often to see if you've made a new post, and keeping you in my thoughts. It is good to read your new words and see the beautiful results of your inspirations. I hope improvements keep coming and that you will have some good news very soon. I just can't fathom the creativity you've used in such a unique project. it requires tenacity and patience too, hats off to you. Wow Lene, you have been so productive and definatley inspiring to yourself and others. I love the dress - the roses in the garden look beautiful now so it's gorgeous to have them captured in so many gorgeous things. I'd like you to know what a great inspiration you are to me. Everything that you make - from your dolls to your quilted pieces to your knitting and sewing - all exceptionally extraordinary. We all go through these hard times, but Lene, you emerge shining. Thank you! Just a note to let you know that I -- like so many others -- am thinking of you. There is an American saying. "This to shall pass"
I miss your blog and hope that your Summer is peaceful enough to inspire more lovely hand work. Quite looking forward to meeting the new 'animal'toy. I have been reading your blog for several years now and was always too shy to give a comment. I am not very sure about my E nglish, but feel driven to write to you now. Your family situation must be very hard to get through, so you have no energy left for your blog. I have been looking every few days for your blog, hoping for good news. 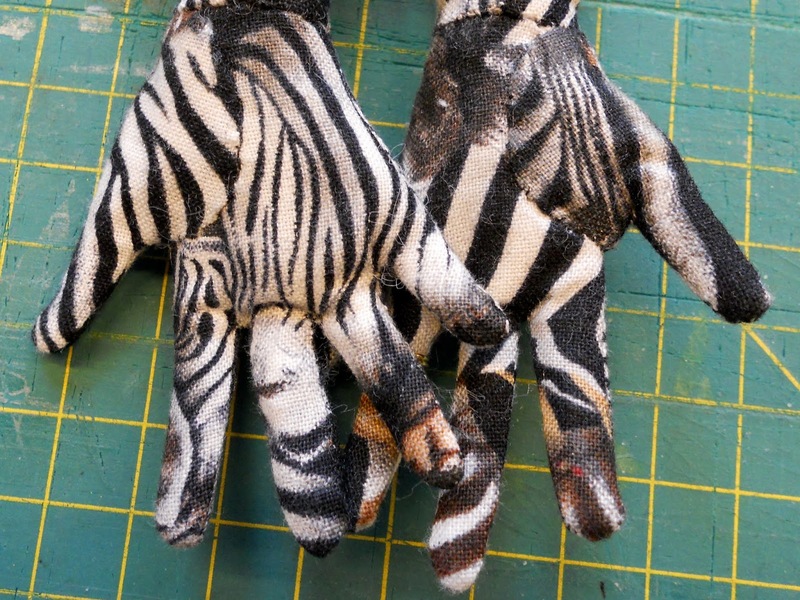 Your creative ouvre is outstanding. I am a trained seamstress myself and look with awe at your tiny perfectly stitched animals and creatures - and this dress is incredibly beautiful. It is very uplifting to see your battle in the face of very difficult times and I wish you to know you are very much in my thoughts. I think there are many of us, never writing but thinking of you with love and respect and wishing you and your familiy all the best. I've been checking in every few days, hoping that you have posted. Please know that we are out here, thinking of you, sending positive thoughts your direction, wishing you and yours well. All the best!